Platinum Double Diamond Set Fitted Wedding Ring Set — Form Bespoke Jewellers Ltd.
A perfect fit, platinum and diamond set wedding ring. The customer came to us for a pair of matching fitted wedding rings that would sit on either side of her solitaire engagement ring. Designed alongside the guidance of our expert jewellers, the bespoke rings have two bold curves in the band that wrap around the engagement ring head. Petite round brilliant cut diamonds are grain set into the shoulders of both rings too. For added sparkle! 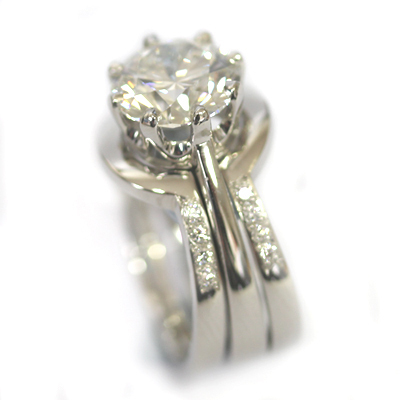 The rings are cast in platinum to match the customer’s existing engagement ring. A beautiful fitted wedding ring set. These sparkling wedding rings were created as part of a complementing wedding ring set, to sit alongside a Palladium Brushed Finish Gents Wedding Ring with Engraving.